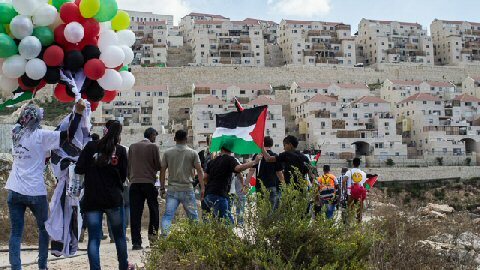 Residents of the Bethlehem-area village of Wadi Fukin have begun weekly demonstrations against Israel's planned expropriation of 4000 dunams in the West Bank. 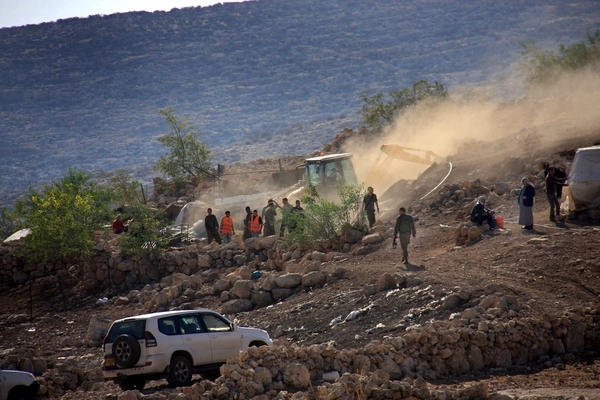 For five weeks now the villagers have been protesting against this theft of land, 25 percent of which belongs to Wadi Fukin. Unaccustomed to Israel's military repression, many villagers told the AIC they were shocked when the first protest was met with copious amounts of tear gas. Still the community continued protesting, altering the protest route in order to reduce Israeli violence, and support has been growing. “The fourth demonstration was heavy and well attended”, a protestor who does not wish to be named told the AIC. A committee to organize the protests was established and the weekly protest is meant to continue. A smaller number of protesters took part in last Friday's demonstration as many were preparing for the Eid al Adha holiday, which began that night. Around 40 villagers, internationals and journalists marched toward the nearby settlement of Beitar Illit, before soldiers prevented them from advancing. Large banners, made to fly with balloons, that stated “This is our land“ in Hebrew were subsequently taken from the demonstrators by the soldiers. Protestors carrying signs and flags were met with aggressive behavior and as the demonstration retreated, soldiers started to chase the protesters. A volunteer medic from the Palestinian Medical Relief Society medical team was detained, blindfolded and handcuffed, but later released on site. Two stun grenades were used against protestors who were throwing stones at the soldiers near the village after the demonstration had ended. Already surrounded by Tsur Hadassah and the settlements of Beitar Illit and Hadar Beitar and with new plans to build a further settlement to the west, Wadi Fukin residents fear being completely surrounded by settlements. And as 60 percent of the community’s population relies on agriculture for their livelihood, the land grab will have disastrous effects on their economy. However, discussions about the weekly event have arisen in the village. Some villagers do not participate in the protests. They fear losing their work permits in Israel while others do not hold the necessary paperwork and see no possibility of winning the struggle against the planned land theft. Mayor Ahmed Sokal, however, stated that the village council will help those lacking the required documents. Israeli forces, on Sunday, notified residents of Khirbet Um al-Jimal, a locale to the east of the West Bank Tubas governorate, of their intentions to demolish their homes, according to a local source. EU High Representative Catherine Ashton has denounced recent Israeli plans to further colonize Palestinian-owned lands. Head of the al-Maleh local council, Aref Daraghmeh, said that Israeli soldiers stormed the area, took photos and verbally notified the residents of intentions to demolish without giving a specific date as to when the order would be implemented. WAFA notes that Israeli forces have demolished the locale several times in the past years, yet residents keep rebuilding it, refusing to leave their land. Israel aims to empty the Jordan Valley of Palestinian residents, who are mainly Bedouin, as it plans to keep the area under its control in any future deal with the Palestinians. Palestinians, on the other hand, say the Jordan Valley, which makes up almost a third of the West Bank, is vital for the future Palestinian state both economically and politically and will not accept any Israeli presence there in any possible future peace deal. On the international level, WAFA further reports that EU High Representative Catherine Ashton condemned the recent Israeli decisions to approve a plan for new settlement activity in Givat Hamatos, and to allow for further settlement expansion in the neighborhood of Silwan in East Jerusalem. A statement issued on Friday asserted: “This represents a further highly detrimental step that undermines prospects for a two-state solution and calls into question Israel’s commitment to a peaceful negotiated settlement with the Palestinians. “The EU will not recognize any changes to the pre-1967 borders, including with regard to Jerusalem, other than those agreed by the parties. We stress that the future development of relations between the EU and Israel will depend on the latter's engagement towards a lasting peace based on a two-state solution," the statement concluded. Belgium issued a strong condemnation of the Israeli destruction of a major power grid in the occupied West Bank which was funded by the country, and serving Khirbet at-Tawil village, near the northern West Bank city of Nablus, and demanded Israel pay compensation. Last Monday, Israel demolished and removed 70 electricity poles and around 4.5 Kilometers of cables providing electricity to the village. The cost of the destroyed power grid and network is estimated at 55.000 Euros. Reynders summoned the Israeli Ambassador to condemn the recent Israeli assault, and asked Israel to pay compensation for this destruction. Reynders said that the Israeli violations do not only target Belgian projects in the occupied territories, but also target many projects funded by other countries. Oxfam aid organization said the power network was built in 2007, with Belgian money, and was meant to provide electricity for Palestinian shepherds in the area. The Israeli army destroyed the network on Monday, removing 70 electricity poles and 4.5 kilometers of cables. Reynders said that Israel first issued the destruction order in 2008 and, then again, in March of this year, but Israel went ahead and destroyed the grid last Monday, adding that Belgium conducted utmost diplomatic efforts to stop the destruction. The Belgian official told Flanders TV that he asked the Israeli ambassador to come to the ministry to denounce the violations, and to ask Tel Aviv for compensation. He said that the EU needs to come up with an initiative that stops such attacks, as they do not only target Belgian projects, but also projects funded by other countries. He added that destroying this humanitarian project poses more suffering on the residents, and further complicates their lives and basic needs, including access to water. Reynders further stated that the destruction violated International Humanitarian Law. Palestinian experts attempted to repair the destroyed network and restore power to the area, but Israeli soldiers forced them to stop, and removed them. The Palestinians living in the area are shepherds, producing dairy products and need electricity for their daily livelihood, and for storing their products, including cheese, milk and yogurt. Oxfam is asking the Belgian government to seek compensation amounting to 55.000 Euros needed for repairing and restoring the destroyed grid. Around 250 Palestinians live in Khirbit at-Tawil village, located in Area C of the occupied West Bank, under full Israeli military and civil control. The Civil Administration Office of the Israeli army, in the occupied West Bank, issued a decision on Wednesday to confiscate Five Dunams (1.23 Acres) of Palestinian lands to expand a road section used by settlers of the illegal Adam settlements, east of Jerusalem. Israeli sources said that the plan is meant for expanding road #437, near the Palestinian town of Hezma, and that the new section would “reduce traffic jams on the main road" linking occupied Jerusalem with Israeli settlements in the central West Bank district of Ramallah. The Civil Administration did not provide any information, so far, of what would happen to a number of Palestinian homes in the area which Israel intends to confiscate. Israeli Peace Now Movement said in a statement on its webpage that about 35% of the occupied West Bank is under the jurisdiction of settlements’ "Regional Councils”. Peace Now additionally stated that this means “an additional one-third of the West Bank became off-limits to the Palestinians, and under the control of settlers. The group asserts that settlements led to the confiscation of hundreds of kilometers of lands in the West Bank to build roads leading to them, and to connect them to each other and to Israel. Settlements, and their roads, are spread all over the West Bank, separating Palestinian communities from each other, and lead to severely hindering the movement and access of Palestinians. “These roads do not only deny Palestinian contiguity; they also occupy a significant amount of land that became off-limits to the Palestinians,” Peace Now stated. Bennet Says Taking Over Palestinian Houses a "Historic Achievement"
Israel's Minister of Economy Naftali Bennett has described the recent settler takeover of Palestinian houses, in the neighborhood of Silwan, occupied East Jerusalem, as a "historic achievement." On Wednesday morning, Israeli settlers stormed al-Aqsa Mosque again, under police protection. 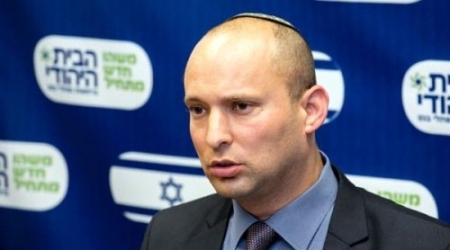 According to Al Ray Palestinina Media Agency, Bennett welcomed what he described as "housing Jews in several houses in the Silwan neighborhood of East Jerusalem", during a visit to a number of houses in the neighborhood, last night. Israeli radio quoted him as saying, "The seizure of these houses is an achievement, as it makes the majority of the population Jews." On Tuesday, settlers seized 10 buildings belonging to Palestinians in the Silwan neighborhood, supported by the association for illegal settlement of "Elad" and the protected by the Israeli police. He added that the settlers tried to ascend Dome of the Rock, but that the worshipers confronted them.
. Eyewitnesses said that Israeli forces continued to close the gates of the mosque, preventing Palestinian worshipers from accessing its courtyards. Women of all ages, in addition to men under the age of 50, are regularly prevented from entering Al Aqsa. Abu Atta further stated that Israeli authorities have imposed special measures gor Eid al-Adha, especially over Friday and Saturday, because these days coincide with the Jewish holiday of Yom Kippur. On this day, vehicle movement in streets is not allowed. Additionally, during the days of Eid al-Adha, the mosque will be closed to foreign tourists and Jews, and Mr. Abu Atta expects that incursions will renew following the holiday. About 217 Israeli settlers stormed the mosque, on Tuesday, under protection of special Israeli police. For more background info regarding the sensitive nature of this topic, see IMEMC's coverage of Tuesday's invasion. The Israeli Occupation Forces (IOF) Tuesday handed over nine citizens from Wadi Nis town in Bethlehem demolition notifications against their homes under the pretext of being built without permit. Local sources confirmed that large Israeli forces stormed the town and handed notifications to demolish nine homes under construction. Israeli authorities have intensified recently confiscation and demolition policies against Palestinians in Bethlehem; most recently was the confiscation of 1,500 dunums east of the city. A large group of extremist Israeli settlers, with members of the right-wing fundamentalist settlement group "Elad", broke into 23 Palestinian apartments in three buildings of Silwan town, in occupied Jerusalem, and seized them. 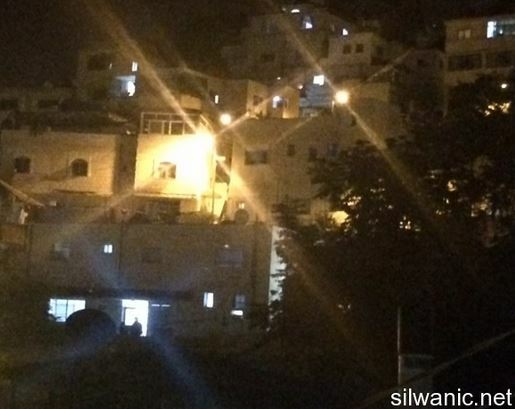 The Wadi Hilweh Information Center, in Silwan, said that the attack started around 1:30 am, when dozens of settlers and soldiers invaded the town, and illegally took over 22 empty apartments, and one inhabited apartment after violently forcing the family out. The Center added that dozens of soldiers and settlers were deployed in Wadi and Beidoun neighborhoods in Silwan, before breaking into the buildings. The apartments belong to members of the families of Beidoun, al-Karaky, Abu Sbeih, Zawahra, al-‘Abbassi, al-Khayyat, Qara’in and al-Yamani. The Center said the ownership of some of the apartments might have been leaked to the settlers through suspicious underground deals. It demanded the Palestinian Authority and all national and Islamic institutions to uncover and prosecute any person who acts on granting ownership of Palestinian buildings to fanatic settler-led groups. The Center further said that the settlers fired rounds of live ammunition, following clashes in one of the occupied homes, after the locals kicked them out. It added that there are currently 29 settlement outposts in Silwan, including 26 in Wadi Hilweh, and that the Elad group illegally occupied the first Palestinian home in 1987 before it conducted an extensive take over campaign in 1991. Adila palace was established in 1959 with permission from the Jordanian government before being legalized later by the Abu Dis municipal council. 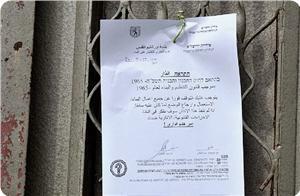 Residents of the Wadi Fukin village received eviction notices as Israel plans on further seizing 400 hectares of land. - Israel recently announced its decision to seize nearly 400 hectares of land in the occupied West Bank, a move anti-settlement activists termed the largest land grab in 30 years. At the time, Palestinian President Mahmoud Abbas called on Israel to cancel the appropriation. "This decision will lead to more instability. This will only inflame the situation after the war in Gaza," presidential spokesman Abu Rdainah said. In a statement published on its website, Peace Now also condemned the land confiscation and said that it would further damage the chance of achieving a lasting peace between Israelis and Palestinians based on a two-state solution. The Palestinian village of Wadi Fukin sits just west of Bethlehem along the Green Line, and is surrounded on three sides by Israeli settlements that are constantly growing. Residents of Wadi Fukin were recently handed down eviction notices and had some of their farmlands destroyed, all with the purpose of forcing them to abandon their village. The villagers have refused to leave and now face a lengthy struggle to stay on their land. The Colonization and Wall Resistance Commission, together with the Jerusalem Legal Aid and Human Rights Center -JLAC- called on Israeli Authorities, International Community and all competent authorities to halt immediately and permanently the ethnic forced transfer of Palestinian Bedouins. Israeli authorities recently published six plans to be implemented in the near future, for the ethnic forced transfer of Palestinian Bedouins from their home communities located in the surrounding areas of Jerusalem, Ramallah and Jericho, into the Nuwei´mah area, an adjacent area of Jericho district. We highlight that this is a gross violation of the international law, according to the joint statement. 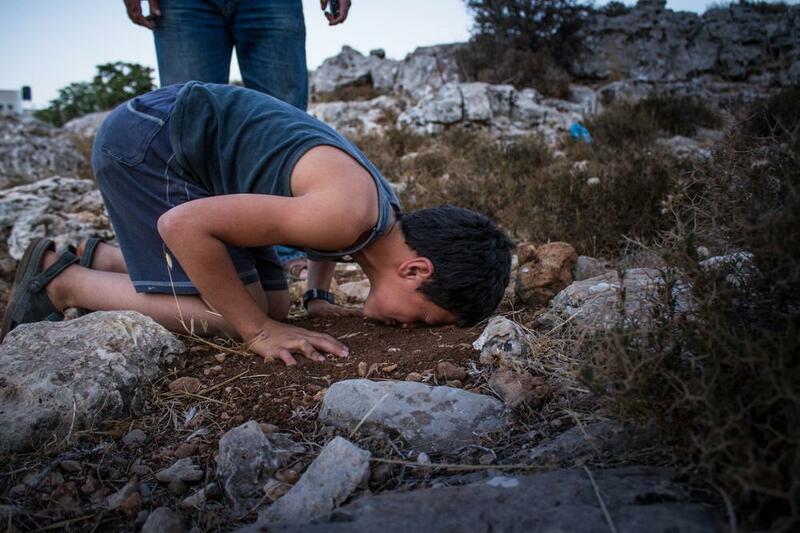 The statement quoted the Coordinator of Government Activities in the Occupied Territory Unit COGAT, subordinated to the Ministry of Defense of Israel, as saying in the Knesset that “these plans aim to evacuate the Palestinian Bedouins from the E-1 area". The two Jerusalemite institutions warned that the implementation of the E-1 plan would have major consequences on Palestinian population; it will exacerbate the isolation of Jerusalem from the rest of the West Bank and disrupt the territorial contiguity between the northern and southern areas of the West Bank. It will have a great impact on the Palestinian economy and social development as well as it will undermine the creation of a Palestinian State, ending the possibility of a Two State Solution for Palestinians and Israelis. The statement concluded by calling to immediately and permanently halt the ethnic forced transfer of Palestinian Bedouins including the E-1 and Nuwei´mah Master Plans and their sub-sequenced plans and to act accordingly and respect the international humanitarian law and international and bilateral agreements regarding the safeguard and respect of the human rights of the Palestinian people. “I urge the Israeli authorities not to proceed with the transfer of these communities and I also urge the donor countries to take a firm stand against it,” he declared. According to the UNRWA statement, in April 2014, the Israeli authorities made public a plan to relocate rural Bedouin communities living throughout the West Bank to three areas, Nweima, al-Jabal and Fasayil. The large majority of the communities targeted for transfer are Palestinian refugees registered with UNRWA. The communities also include those residing in the E1 and Ma’aleh Adumim areas near Jerusalem, which have been slated for new Israeli settlement development and possible expansion, the statement added. “There are concerns that the planned population transfers will be implemented shortly after Israel’s final approval of the Nweima plans, and that pending demolition orders will be executed, destroying the homes and livelihoods of these communities,” he further maintained. 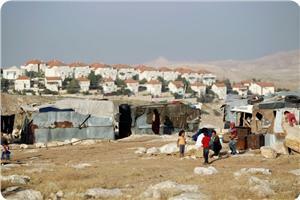 The Bedouin community has continually and expressly opposed its relocation. As Palestine refugees, the Bedouin wish to be allowed back to their traditional lands in the Negev. Pending this, they wish to remain in and be part of temporary plans at the locations where they currently reside, UNRWA proceeded. 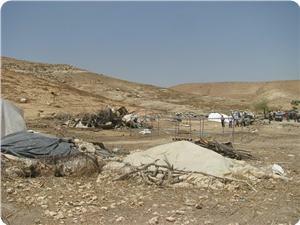 The statement raised alarm bells over the countless Bedouins who have been living under the daily threat of displacement, owing to frequent property demolitions, seizure orders, evictions and confiscations that have arisen because they do not have access to a fair, non-discriminatory zoning and planning system, which Israel, as the Occupying Power, controls in Area C. Now, in the aftermath of the publication of the Nweima plans, the threat of losing their homes looms larger than ever. Many of the Bedouins targeted for transfer have resided in their current locations for decades, having fled to the area from their traditional ancestral lands as a result of the 1948 Arab-Israeli conflict and are unable to go back. Following the Israeli occupation of the West Bank, including East Jerusalem, these communities have witnessed the growth of Israeli settlements around them. The international community, including the UN Security Council and the International Court of Justice, has condemned the establishment of settlements in the occupied Palestinian territory as a violation of the international law, UNRWA statement further said. At least 20 Muslim graves were demolished on Sunday by the Israeli occupation authorities (IOA) near al-Yousfiya cemetery, adjacent to the eastern wall of holy al-Aqsa Mosque. The demolition procedure had been carried out under pretext that the tombs were dug on land tracts expropriated by the IOA for other projected ventures. Mustafa Abu Zahra, head of the Restoration of Muslim Graves Committee in Jerusalem, denounced such arbitrary demolition procedures, dubbing them signs of disregard for the sanctity of dead Muslims. The targeted graves have been newly built over a purely Islamic property as an extension to the historical al-Yousfiya graveyard, located in Bab al-Asbat, where hundreds of martyrs and Muslim icons were laid to rest, Abu Zahra further confirmed. 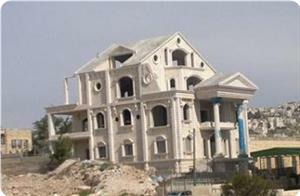 He denied Israel’s claims of land ownership, insisting that the estate is a purely Islamic endowment. It is quite normal therefore that Palestinians would not seek anybody’s permission before burying their dead citizens. Ahmad Salah, coordinator of the Popular Committee against the Wall and Settlements in Bethlehem, said the soldiers invaded Um Rokba area, south of al-Khader, and handed an order to resident Osama Salah, to demolish his car repair structure. The resident was informed that he has a week to demolish the structure; otherwise, the army will demolish it and send him the bill. He said the army handed him a similar order nearly five months ago. Israel continuously limits the ability of the Palestinians to build in their lands, in areas that are under direct Israeli military and security control in the occupied West Bank, but continues to build and expand Jewish-only settlements in the West Bank, and Jerusalem. Israeli forces raided and took photos of Palestinian homes in the villages of Ma'in and Al Karmel, located respectively to the east and southeast of Yatta, south of Hebron, while settlers performed religious rituals, said a local activist. Soldiers forced Palestinian locals out of their homes before breaking into, ransacking and taking photos of the homes, as well as of the entire area, according to WAFA Palestinian News & Info Agency. Meanwhile, dozens of Israeli settlers, under the protection of soldiers, raided Al- Karmel and performed Talmudic rituals at some local archaeological sites. According to Palestinian Village Profile information, Ma’in is surrounded in three directions by many illegal Israeli settlements and bypass roads. Three settlements lie to the east, two to the south and one to the west, with one bypass road to the east. Additionally, two barriers of sand mounds were set up by Israeli forces, on the main road of the village. WAFA further reports that, since the beginning of the Second Intifada, two houses were demolished and 150 dunums of land have been confiscated from the village. The Palestinian Village Profile notes that Al Karmel has a long history, dating back to the Canaanite period. The name "Al Karmil" is derived from a Canaanite word, which means “God’s Blessing”, and the village keeps its name until this day. The residents of the village are indigenous to the area, while two illegal Israeli settlements, “Karmiel” and Ma'oun”, are situated to the East of the village. Karmiel settlement occupies 1,500 dunams and Ma’een occupies 2,000 dunams. In addition, the area is surrounded by bypass 'Route 60' occupying 80 dunams to the east. 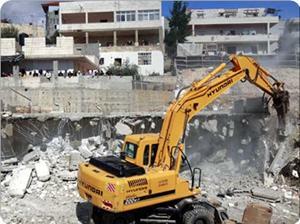 Israeli forces destroyed at least four housing units and/or structures belonging to local residents. 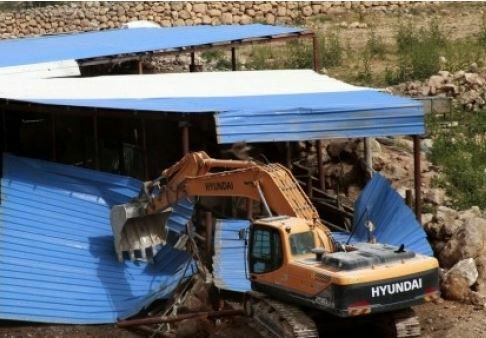 In related news, Israeli forces delivered demolition orders to three Palestinian families in the southern West Bank town of Ethna, on Thursday, according to the landowners. Ma'an News Agency reports that Amjad Hilmi Nofal, owner of the one of the properties, said that his family of seven have lived in their home for 10 years, now. Nofal's brother, Awad, and his family of nine have lived in their home since 2007, while a third house additionally slated for demolition belongs to Arif Abd al-Hamid Abu Zalata. 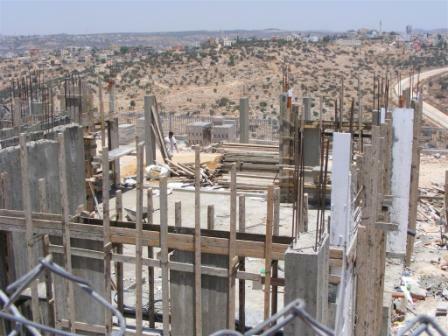 The families reportedly received military orders to stop construction seven years ago and have been filing appeals with the Israeli Supreme Court ever since. Mayor of Idhna, Hashim Tmeizi states that Israel is trying displace Palestinians from the town, with hundreds of families now threatened with demolition orders. Ma'an further reports that the properties are located in Area C which, according to the Oslo Accords, is under full Israeli security and administrative control. Approximately 27,000 Palestinian homes and structures have been demolished by Israel, since it occupied the West Bank in 1967.